The Covent Garden Car Park (468 spaces) – due to be developed in early 2019. A masterplan to regenerate the ‘Old Town’ (Cultural Quarter). The Town Centre Vision and Neighbourhood Plan. We actively monitor the health of the town centre and can provide information on footfall, car park use and vacancies. We also work in partnership with other stakeholders including the District and County Council, the Royal Priors Shopping Centre, Regent Court Shopping Centre, the Royal Leamington Spa Chamber of Trade and others. We are very happy to meet prospective tennants, property owners and investors to discuss ideas or plans and to share information and experience. Please contact us on 01926 470 634 to make an appointment. The Covent Garden Car Park has been earmarked for renewal or redevelopment since 2012, as it has fallen into a state of disrepair. It is made up of a surface car parking area (81 spaces) used by people parking for less than 4 hours and a multi-storey car park (511 spaces) used for short and long stay parking. This is a popular place to park with ‘ticket sales’ averaging over 800 users per day (25,000 per month) made up of roughly 50% visitors/customers (short stay) and 50% town centre employees (long stay). There are also 132 permit holders using it. In August 2016, the top two levels of the multi-storey car park were closed, bringing the total number of spaces from 592 to 468 spaces, which is the current capacity. 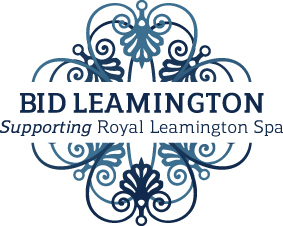 Around this time, BID Leamington in partnership with the Royal Leamington Spa Chamber of Trade began actively speaking to Warwick District Council (WDC) about their redevelopment plans and welcomed the idea of new people working and living in town as well as investment in the car park. Given it is the town’s largest car park and in peak trading periods it is often observed full, it was agreed that the disruption could be managed provided that a strong plan was in place prior to closure, to identify and communicate alternative parking for town centre visitors and staff. Accordingly, WDC gave assurances to the business community that a ‘displacement plan’ would be agreed prior to submitting planning permission for any future scheme. In addition, existing town centre parking constraints were highlighted as well as evidence to suggest that future demand may grow by 17%, so more parking (not less) was suggested. Finally, it was felt, any future development should ideally be innovative and seek to solve some local issues. For example, improving the pedestrian link to the Upper Parade area, perhaps a waste management facility for businesses or some community office space for co-working. Recognising the challenge that closing this car park presented, BID Leamington began helping WDC officers solve the car park displacement problem. This included research into demand, user profiles, the identification of alternative sites and innovative ways to support implementation and communication. We quite quickly realised that the core challenge is both finding spaces that are located suitably to support the type of visit (shopping, visitors, working etc) and then helping visitors to find the spaces whilst managing capacity, as it involves moving people from one very large car park, into many small ones that will fill up quickly. Planning permission was submitted in September 2017 (and granted Jan 18) for the redevelopment of the site for new offices, housing and car parking. However, at this time there was still no displacement plan in place and there were a number of other design challenges, including an on-balance reduction in car parking spaces for the future and the loss of the pedestrian link. After much research and feedback from over 200 member businesses, in November 2017 BID Leamington formally wrote to WDC’s Chief Executive, to set out our concerns and request they consider adding levels to another nearby surface car park called Chandos St. It was felt the investment could be recovered in approximately five years and the additional parking would support future demand, including the Commonwealth Games in 2022. It would also help solve the challenge of where to move around 400 ‘short stay’ (shoppers) per day, as it would provide one well-known place to direct them to. Following this, the BID Leamington Board of Directors (alongside other key town centre stakeholders) took the unprecedented decision to lodge an objection to the planning application. Since then and throughout 2018, we have continued to focus on the challenge of managing the imminent closure of the car park. Around July, BID Leamington suggested an independent parking consultant be engaged to help get consensus on both the need for and scale of a displacement plan, and we are grateful WDC agreed. The report was finalised recently (November 2018) and the details, including the Executive Summary are below. A full version of the report is available on request. Following the completion of a report on the Covent Garden CP closure, BID Leamington and the Royal Leamington Spa Chamber of Trade are calling on Warwick District Council (WDC) to delay the closure until January 2020. It is felt there is not enough time between now (Nov 2018) and March 2019 (the revised closure date) to implement the recommendations in the study. Given the risks of non-delivery and delay, a start date of January 2020 would allow time for the Station Approach car park (100 spaces) to be completed and open (due Dec 2019). It is also important to ensure the closure does not go beyond two Christmas trading periods (November & December) and it is felt the proposed March 2019 start date leaves too little contingency time if the project overruns. Please read on for more detailed information about this report, conclusions and next steps. Please also note: Agreeing on the conclusion of this joint report, whilst an important step forward, is not the equivalent of agreeing the final displacement plan when it emerges, as there are still too many unknowns. 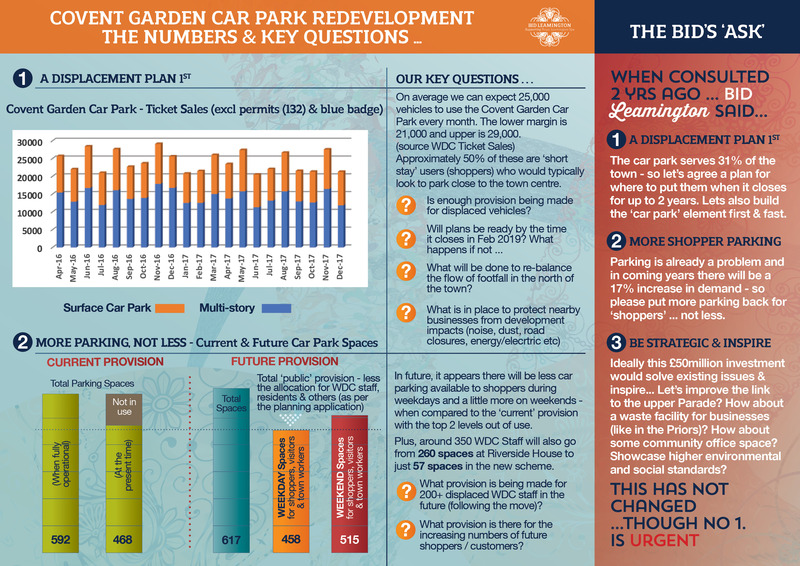 An independent review of Warwick District Council’s displacement parking plan associated with the closure of Leamington’s Covent Garden Car Park for redevelopment has reported its findings. The high-level review was conducted by a specialist parking consultancy jointly appointed by Warwick District Council (WDC) and BID Leamington, ahead of the planned closure of Covent Garden in January 2019 for an estimated 18 months. 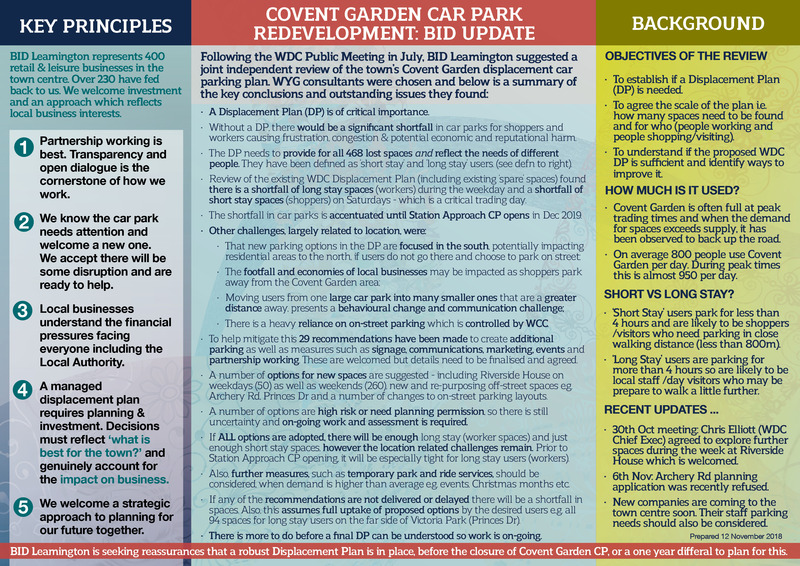 The review set out to agree the requirements of a displacement plan and advise on whether WDC’s displacement parking plan will be effective in accommodating users of Covent Garden during the closure, and to recommend any additional measures. This press release is jointly agreed by BID Leamington & WDC. Please click here to read the full release. The joint independent consultancy report, draws a line under an important and challenging collaboration between BID Leamington and Warwick District Council (WDC), looking at how the closure of the Covent Garden car park for around 18 months is managed. As this is a behavioural challenge not simply an academic one, it is important to reflect on the context explained below and within the report, rather than focusing on isolated statements or numbers. BID Leamington are grateful for the support of WDC officers in delivering this report and where possible, look forward to supporting them as work progresses. To identify ways to address shortfalls and issues (recognising this would be difficult because a number of suggestions have already been explored and discounted by WDC e.g. additional level(s) on Chandos St). On average the car park is used by over 800 people per day (25,000 per month) and currently (with two floors not operational) offers 27% of the town’s off-street parking supply. Having a Displacement Plan in place, prior to the closure, is of critical importance. The DP needs to provide for all 468 lost spaces and location is an important factor, otherwise people will not use the spaces. Based on this, the location of spaces must reflect the needs of different people, who have been defined as ‘short stay’ and ‘long stay’ users – see definitions below. Review of the existing WDC Displacement Plan (including existing ‘spare’ spaces) found, there is a shortfall of long-stay spaces (workers) during the weekday and a shortfall of short-stay spaces (shoppers) on Saturdays – which is a critical trading day. Also, communications and signage plans were not yet complete. The shortfall in car parks is accentuated until Station Approach CP opens in Dec 2019. There is a heavy reliance on on-street parking which is controlled by WCC. To help mitigate this, 29 recommendations have been made to create additional parking as well as measures such as signage, communications, marketing, events and partnership working. These are welcomed and now the details need to be finalised and agreed. A number of options for new spaces are suggested. This includes Riverside House on weekdays (50) as well as weekends (260), new and re-purposing off-street spaces e.g. Archery Rd, Princes Dr and a number of changes to on-street parking layouts. A number of options are identified as high risk in terms of potential for delivery or need planning permission, so there is still some uncertainty and on-going work and assessment is needed. If all options are adopted, there will be just enough spaces however, the location related challenges remain. This includes helping people navigate to new empty spaces and ensuring distant car parks are used by the right people (e.g. not train commuters). The success of the proposed plan, also assumes full uptake of proposed options by the desired users e.g. all 94 spaces for long stay users on the far side of Victoria Park (Princes Dr). If any of the recommendations are not approved or delayed there will be a shortfall in spaces for certain users (shoppers and/or employees), so alternatives need to be found to avoid frustration, congestion and potential economic and reputational harm. The first year, with Station Approach closed, is particularly tight. Also, further measures, such as temporary park and ride services, should be considered, when demand is higher than average e.g. events, Christmas months etc. Our view is that there is more work to do and potentially other creative and innovative ideas need to be explored, before a displacement plan can be finalised and delivered. Given planning permission and construction timeframes as well as the need to positively engage the wider community and inspire cooperation, it is likely this will require more time, than the three months available before the car park is due to close (March 2019). Furthermore we are mindful of the commitment that has been given to ensure construction does not go over two Christmas trading periods (November & December), so have concerns that a March 2019 or later start date may not leave sufficient contingency for potential construction delays. For this reason we support the Leamington Spa Chamber of Trade, who has requested that the start be delayed to January 2020 to enable more time to prepare. The consultants had to make judgements about a number of inherent challenges and assumptions, related to the use of technical data, from many sources, as well as people’s needs and behaviours. These have been outlined in the report and should be taken in to account when reviewing the conclusions. For example, the demand for car parking spaces constantly changes in terms of the time of day, days of the week, events, seasons and physical / external changes such as, businesses opening (with staff parking needs), or edge of town development (such as new homes or road works). Using ‘ticket sale’ data, demand was therefore based on average use over one year, at the peak time of 1pm. This means that when demand is ‘above average’ further interventions beyond those recommended in this study, will be needed to support businesses, particularly retailers, who rely on peak trading periods. Also, the figures did not account for times when the Covent Garden car park is beyond full. For example, when demand exceeds supply and drivers turn away (and don’t buy a ticket) as has been observed at Covent Garden. Another assumption is related to parking visits, which were defined as either ‘short stay’ (less than 4 hrs) or ‘long stay’ (greater than 4 hrs). This was used to distinguish ‘shoppers’ whose visit may be shorter, but they need to be closer to their destination and ‘employees’, who stay longer and may be prepared to walk a bit further. A distance of less than 800m was used to guide what might be acceptable for a ‘shopper’ to walk and approx. 1000m for an ‘employee’. However, this does not account for specific user needs (e.g limited mobility) or how to support the change in behaviour needed, especially in winter or poor weather. For these reasons, the assessment in this report may be considered conservative particularly prior to December 2019, when the Station Approach car park is not yet open (100 spaces). BID Leamington will continue to monitor progress and feed the concerns of businesses back to WDC. BID Leamington are happy to facilitate further meetings with businesses and WDC as the impacts, particularly on those located closer to the site, go beyond car parking. We will also continue to identify innovative ideas, as we know it will take a ‘community approach’ to bridge the challenges related to this car park closure. Our joint statement can be read above. The Executive Summary can be downloaded here. Please contact us for a copy of the full report.